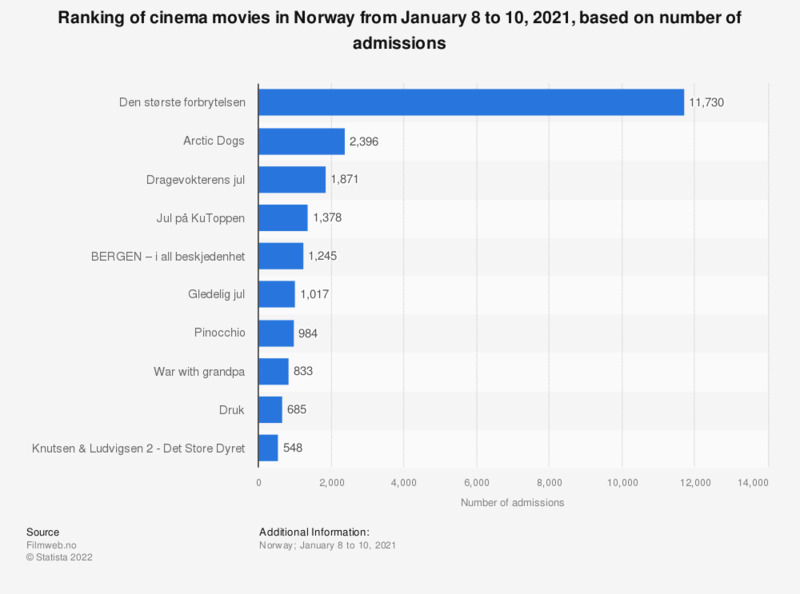 This statistic displays a ranking of cinema movies in Norway from April 19 to 21, 2019, by number of admissions. The animated film 'Wonder Park' (more than eight thousand admissions) was ranked first. In second and third place came 'Shazam!' based on the DC Comics (approximately 7.9 thousand admissions) and the romantic drama movie 'After' (roughly six thousand visitors). Although the cinema ticket prices increased in the last years - on average from 86.57 Norwegian kroner in 2010 to 113.5 Norwegian kroner in 2018, admissions in Norwegian cinemas remained stable and in 2018, the number of moviegoers amounted to roughly 12.12 million. Based on admissions, the leading cinema chain in Norway was Nordisk Film Kino in the mentioned year, with a market share of 29 percent, followed by ODEON (27 percent) and Kinoalliansen (15.2 percent).